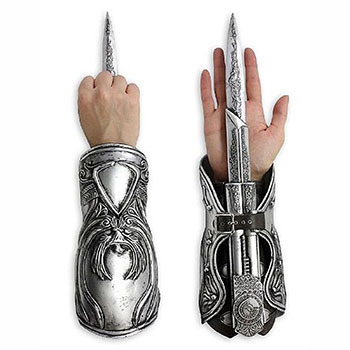 This metal gauntlet “hides” the spring-loaded knife. If you can consider wearing an enormous, heavy metal gauntlet in public to be a good way of hiding something. Too socially-anxious or depressed to go to a barber shop or HairCutz chain-snippery? 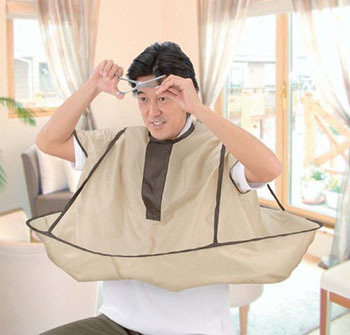 Throw on Easy To Make Haircut At Home! (yes, that’s the actual product name) and give yourself a haircut that matches your emotions. One man’s review explains that he cuts hair in his garage, and it’s cold out there, but it’s fine to wear a coat underneath Easy To Make Haircut At Home!. “Simplify your life,” says the manufacturer of these buttons, apparently unaware that it’s easier to speak a single word than purchase and arrange a collection of sound-effects buttons on your desk. Besides, if you’re the button-pressing kind, your options are going to be sorely limited without the “Damn!” button.